I am currently writing this post on my Chromebook in a hotel room. I am traveling for a wedding this weekend, so my posts over the next couple of days might not be very detailed. I am not using hotel WiFi, because hotel WiFi can be frustrating. I spent a month in a hotel last year, and I never felt good about using hotel WiFi. I never felt secure using it, and ended up paying for a VPN client to help keep my connections secure. The connection speed was also noticeably slow. Right now I am connected to the internet from my smartphone hotspot. This is a sweet setup because I know the connection is secure since it is password protected. It is also very fast since the connection is off the 4G LTE off my phone. The only thing I have to worry about is my phone overheating, so I'm not going to keep it connected for too long. Also, Verizon launched go90 today. 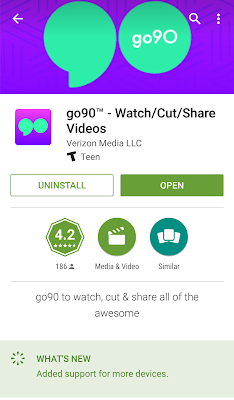 I don't know a whole lot about it yet, but go90 is an app to stream video. From my limited use so far, it reminds me of a cross between Hulu Plus and the videos from "Discover" section on Snapchat. With going through the app for a few minutes, I was able to find video that interested me in the form of Smosh videos and the Daily Show videos. I enjoyed watching the Daily Show pieces on Snapchat, and it appears I can watch the full show on go90. One good thing so far about the app is when I backed out of the app while watching a video to send a text, resuming video was painless and it didn't glitch and have me start from the beginning. One bad thing so far is that when I "go90" and turn my phone 90 degrees, it doesn't go until full screen mode. I'll keep messing with the app to figure out why, and I hope it's not because my phone is getting old.